Wallages Cottage and The Granary have been converted from the farm's granary and hayloft. These 2 adjacent cottages offer comfortable accommodation in an attractive period setting. Each cottage sleeps upto 6. 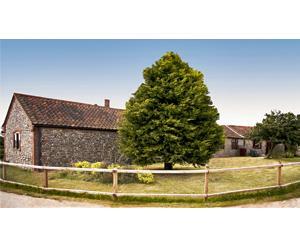 Character cottages with beams and open fire, full central heating and well equipped kitchen. Colour television, video and hi-fi. Three bedrooms (a double, a twin and a bunkbed room), all adult sized beds. Own patio and garden furniture, mature gardens and children's play area. Baby/toddler equipment available. Ample off-street parking and self service laundry facilities. From A149 From North Walsham, follow the Mundesley signs to Knapton (3 miles). In Knapton after sharp right-hand bend. White House Farm is 300yds on the left. From North Walsham - 3 miles From North Walsham, follow the Mundesley signs to Knapton (3 miles). In Knapton after sharp right-hand bend. White House Farm is 300yds on the left.